Camden was born not breathing. He was immediately taken to the NICU. At just 6 hours old, he had a seizure and was diagnosed with hypoxic ischemic encephalopathy, or HIE. He was taken by Angel Flight to Emory Midtown and was placed on a cooling blanket for 7 days. This was to help minimize any brain damage that may have occurred. 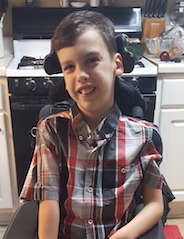 Camden is a smart child and has no developmental delay, other than with his muscles. This includes his speech. He can move around on his hands and knees, but uses a wheelchair while at school and out in public. He also uses an AAC to talk for him. He is quite a comedian and loves to make others laugh. He is also a daredevil! He likes to go fast. He is currently 9 years old and in third grade. He will turn 10 in November and wants to go indoor skydiving for his birthday. Playing Xbox video games, collecting baseball cards, watching & keeping up with WWE Wrestling, helping Dad outside with yard work & DIY projects. Clothing- Pants, Waterproof bibs, Fleece or flannel lounge pants with long sleeve t-shirts (we use this as his PJ’s). Fuzzy socks or slippers, sheets. Family can always use help with gas & groceries.